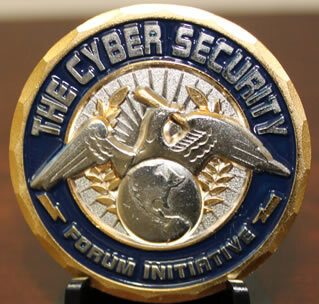 The Cyber Security Forum Initiative is pleased to announce the official release of the very first CSFI challenge coin! These limited edition coins are numbered and beautifully crafted. 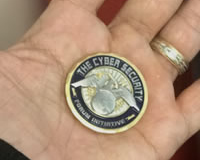 CSFI is offering its members the opportunity to purchase a limited number of these high quality challenge coins. 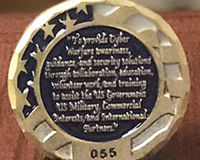 Challenge coins are often carried as a symbol of pride, teamwork, and unity among the bravest of our society. 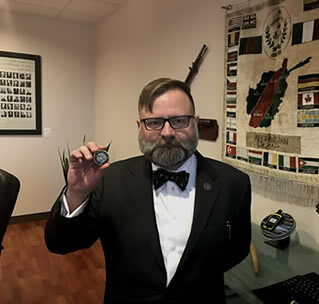 The traditional use of challenge coins that developed from its military origin goes back at least half a century, with some accounts all the way back to colonial times. The reason challenge coins have stood the test of time is because they are proven to be effective as a way to build camaraderie and team loyalty. Challenge coins have become a long-lasting, highly-collectible way to show your allegiance anytime, anywhere. Support the CSFI mission, and proudly display your limited edition CSFI coin at work or at home! 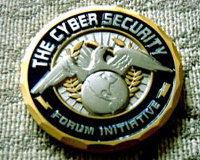 In addition to being one of the founding members of Cyber Security Forum Initiative (CSFI), LCDR Roger W. Kuhn, USCGR (ret), has an eclectic Cybersecurity professional background: he is an experienced Applied Research Scientist/Engineer (led 1st DOD research into militarization of 4G wireless technologies; led development of the 1st Joint DOD media agnostic Mobile Ad hoc MESH (MANET) protocol ); a former Science & Technology Advisor to DOD Senior Executives & Flag Officers (US Navy Cyber Operations, Signal Intelligence, Special Operations and Expeditionary Warfare Communities); an experienced former Cyber Operator (USAF Cyber Operations Officer course graduate and Cyber Operations Exercise Director); an experienced Academic (George Washington University Adjunct Professor, Cybersecurity); and a former Command, Control, Communications, Computers, Combat Systems, Cyber, Intelligence, Surveillance, and Reconnaissance (C6ISR) Systems Integrator (led a diverse technical team that successfully conducted research, development, testing, evaluation and integration the 1st commercial core switch-based, mission critical, DOD cybersecurity and cyber resilient-compliant, integrated warfare system network on a USN vessel). 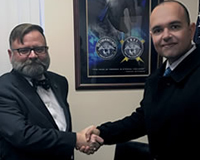 He has also been an Office of Naval Research (ONR) S&T Envoy to the countries of Estonia, Georgia, and the Kingdom of Saudi Arabia; a Cyber Operations planner (CSFI Introduction to Cyber Warfare Operational Design (ICWOD) course co-developer & instructor); and a recognized Full-Spectrum Cyber Operations Policy Subject Matter Expert (CSFI Advisory Director and Education Fellow). LCDR Kuhn is an experienced Senior Information Assurance (IA)/ Cybersecurity Engineer and Certified Information Systems Security Professional (CISSP) #85742 in good standing and a registered DOD IA/Cybersecurity professional; a certified 4G WiMAX Radio Frequency Engineer (WRFE); and Certified Wireless Network Expert (CWNE) #56- there are currently less than 200 CWNE’s worldwide. 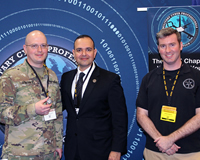 In recognition for his past, present and future contributions to CSFI and by extension the DOD Cybersecurity community, LCDR Kuhn was presented the 1st CSFI Command Coin by CSFI Founding Director Paul De Souza on Friday, 16DEC16.